Just How Offensive is a Picture of Jesus? It is my general policy not to Blog any of my personal views but due to a silly Facebook post, I felt compelled to write this. Please indulge me this one time. I promise it will not happen again. Back in the days when I went to school, we had to study and learn about Egyptian Pharaohs (who believed that they were Gods), Nero, Caesar, Napoleon, Hitler, Abraham Lincoln, Martin Luther King Jr. Gandhi, and Golda Meir. The reason was because of their contributions, good or bad, to history and their effect on the world. You know who we didn’t have to learn about? …Jesus! Yet Jesus is a very prominent historical figure who was a man of the people and killed by the “church leaders” of his time. He was an advocate for equality and peace. His quiet and peaceful movement called for turning the other cheek and people loving one another… very much like Rev. Dr. Martin Luther King Jr. And also Like Rev. King, he was killed because of it. The other day I came across a post on Facebook that begged the question “Do you think a picture of Jesus Christ belongs in a public school?” The apparent reason for the enquiry seemed to stem from the local channel 12 news report about a school that took down a small framed photo rather than go to court over it. It was my first instinct to say a great big “NO” in response but then I started to really ponder the idea and what it represented in actuality. In this day and age when kids are looking up to role models like Snooki, Kardashian’s, Honey BooBoo, and the Situation, just to name a tiny few (which by the way, America embraces wholeheartedly) why all the stress about a simple picture of Jesus? I know that in my school we had pictures of Gandhi, Buddha and Golda Meir. None of these people were American leaders and all three were also icons for their own respective religions. Yet no one seemed bothered by the images. In a time when it’s “IN” to be selfish, greed is a common and excepted way of life, and sickos who believe that wiping out dozens of innocent lives with assault weapons at movie theaters and elementary schools will make them “go out in a blaze of glory,” is it really so bad to see an image of a gentle man of peace and love? After all, the school is not teaching about Jesus or Christianity it’s merely a picture on a wall in a hallway. I didn’t become Hindu because I saw a picture of Gandhi every day nor did I ever consider switching to Buddhism or Judaism because pictures of Buddha and Ms. Meir hung in my classroom. I did however admire all three and wanted to strive to be more like them. The point I am trying to make is; whether or not you believe that Jesus was the son of God is totally irrelevant. You do have to agree that he is a historic figure that represents peace, love and humanity; qualities that are becoming quite extinct in our modern world. 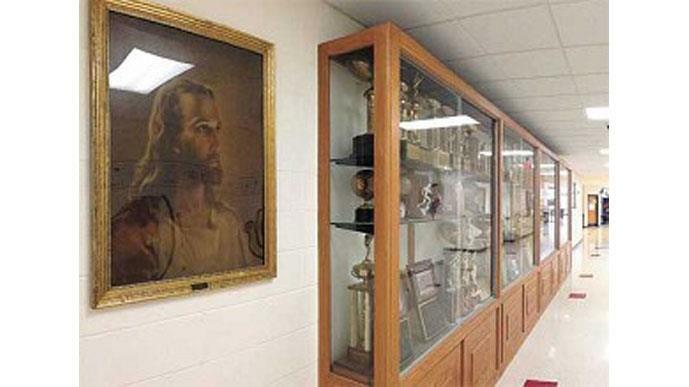 For the record, I would not be the least bit offended by a picture of Mohammad or Moses hanging in a school either. Maybe the best way to settle the “big picture dilemma” would be to add pictures of Moses and Mohammad rather than remove Jesus. It may do kids good to have small reminders of kindness, leadership and love to reflect upon, if and when they even look up, as they rush through the busy, crowded hallway from class to class. If on the other hand, the school was “preaching” about Jesus or Christianity, even though I am a devout Christian myself, I would be very upset. A public school is NOT a place for any religious teaching. Such teachings should come from your own individual churches, temples and quite frankly, your home. When will America’s great offence with religion end? Americans fought to have prayer stopped in classrooms even though the prayers were non-sectarian. Even now, folks are fighting to remove the phrase “Under God” from our pledge of allegiance. I love when they ask, “whose God?” Silly me, I was under the assumption that there was only one! Every piece of American money we handle says “In God We Trust.” Should we be rallying to have that removed from our currency? What about the Declaration of Independence? It says that “All men are ‘created’ equal. That they are endowed by their ‘Creator’ with certain unalienable rights.” What if you don’t believe in a creator? Should this now be removed from the document that explains the very notion that our country was founded upon? What if non-believers started to feel offended by any sign of religion? Should crosses, stars and windows that adorn our houses of worship be removed to keep all signs of religion inside the building as not to offend the atheists and agnostics who may have to pass them on public streets daily, or so none of us would be offended by symbols of religions other than our own? While we’re at it, why don’t we ban wearing jewelry in the form of crosses, stars and other iconic religious designs in public? People, it’s a picture. There could be (and certainly are) a lot worse things for our youth to have to look at in a public building or any other place for that matter. I’d worry more about what they’re looking at on television if I were you. Just my humble opinion.